There are so many ways to see Las Vegas, on foot, of course, being the most common method. Sure, you get an up-close and personal view of everything Sin City has to offer - from the street entertainers to the gorgeous flashing lights of its many resorts. You can get some pretty nice pictures out of it, too, if you can find the right spot and avoid being trampled by the crowd. There is another popular means of experiencing the city, though; one that requires you to let go of that fear of heights and just let your inhibitions fly. If you've driven or walked down Las Vegas Blvd at any point, you have probably taken notice to the helicopters that circle the city. These aren't military runs from the local base, nor are they news choppers capturing the going-ons of the city. These are tourists, like you, that wanted to see Las Vegas in a different light. They wanted to see Las Vegas without the crowd of people around them, and there's an undoubtedly good chance that each of these high-flying daredevils would agree that via a helicopter is the best means of capturing Sin City's essence. From above, the city's lights seem that much brighter. The city itself seems that much livelier. It's almost like magic that, the higher you go get, the more impressive Las Vegas seems. It's not just the glowing lights of the resorts that will catch your eye. It's the stark contrast between the shimmer of the city and the sheer darkness that resides not-too-far in the distance. Via a Las Vegas helicopter tour is the only way to be able to see the city of Las Vegas against its true backdrop, the surrounding mounts of the valley. If you can't find a picturesque view in that, than you're simply not trying hard enough. You may be afraid of heights, but these local pilots have flow the path countless times and know Sin City's wind and weather patterns enough to know when it's safe to fly. It's a potential once-in-a-lifetime opportunity that you just have to take. You'll get a truly intimate view of Sin City, one that few people can claim to have seen, and think of the bragging rights you will have when you say you soared above the city. 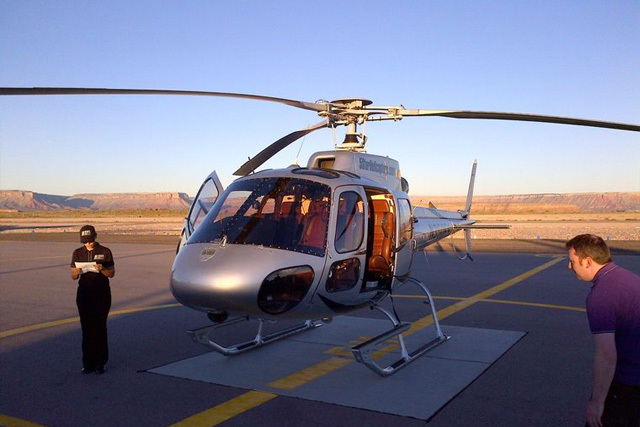 Book your helicopter tour today for your chance at the best view of Sin City imaginable. Tour Las Vegas in a way you never thought possible with the Serenity Tour. 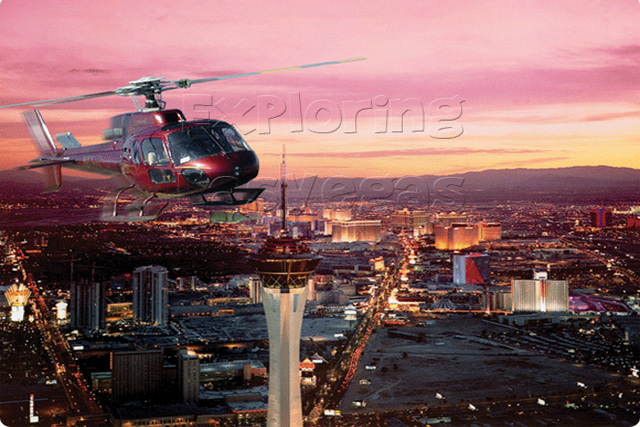 the Las Vegas Helicopter Tour will leave you breathless as you see both sides of Las Vegas from the air. You will get to see the shimmering, crystal waters in the area, as well as the lighted sky of downtown and the Strip, which have made Las Vegas the metropolis it is today. When you begin your trip, the views from the air of Hoover Dam and Lake Mead will be more than you ever could expect. You will be riding in Helicopters' premiere jet-helicopter. As you pass over the lake, you will arrive along the coastline and your jet-helicopter will be lowered down where you will embark on an amazing adventure.